Great news for everyone who is using S2R Periodicals or just going to try this RSS to Kindle service. I’m glad to inform you that after a lot ot research and hard work, S2R Periodicals have got periodical formatting! So, by default all your periodicals will now be formatted like Kindle magazines and newspapers. 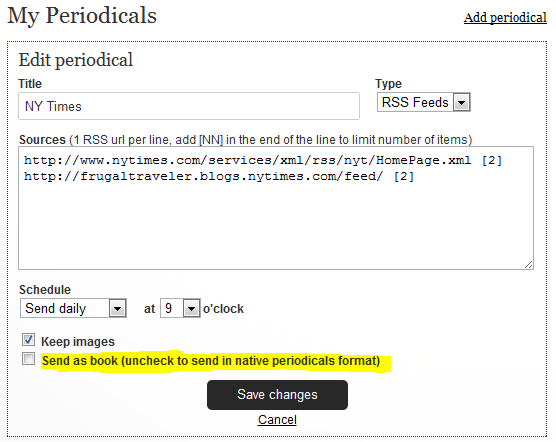 That does not mean though that you can’t use book formatting for your periodicals. Take a look at the screenshot below. As you can see, there is a new checkbox called “Send as book”. Keep it unchecked and the periodical will be sent in its native “Kindle periodicals” format; check it and the periodical will be sent in the form of book. It’s way easier in terms of navigation, especially if you bundle several RSS feeds in a single periodical. Most of navigation actions can now be performed in a single move/click of the stick: press its center to see the Sections List; tap its left or right side to navigate to the previous or next article. When you are in the in the Sections List, press the upper or bottom edge of the stick to switch from one section to another. No more overflow in the list of books on your Kindle. Only the most recent issue is shown on your Kindle’s home screen. Old files are automatically moved to the “Periodicals: Back Issues” folder. So, even if you don’t delete each issue from your device, your home screen will stay organized. I do believe, this new format of periodicals is one of the best and most important improvements I’ve made so far. Because it makes my Kindle an ultimate news reading device. Give it a try, subscribe to one of the predefined periodicals, it’s free. i like it so much.try it.